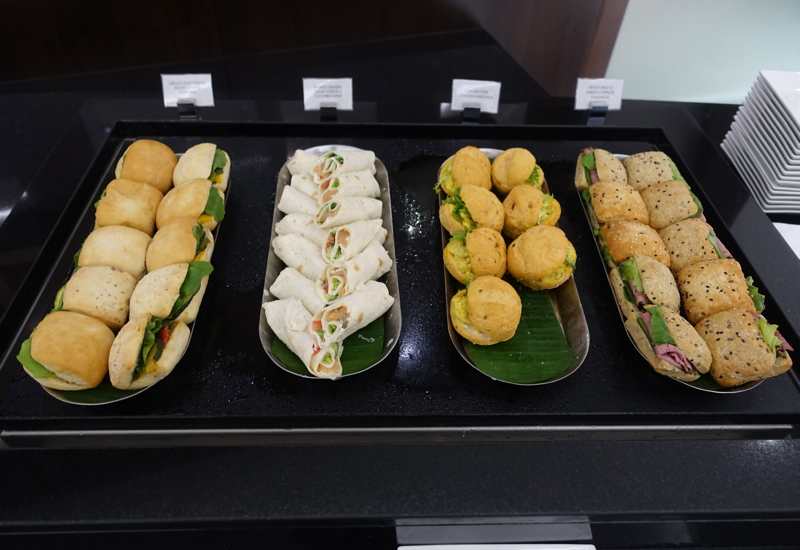 This review of Etihad's Business Class Lounge in Abu Dhabi (the Etihad Premium Lounge) is based on the photos and trip note of my husband, who flew Emirates First Class on the A380 New York to Dubai and then Etihad First Apartment on the A380 Abu Dhabi to Sydney, Australia. My husband was picked up by a driver (a third party contracted by Etihad) at the airport in Dubai, and was driven to the airport in Abu Dhabi. He found the drive to be quite pleasant, but he grew alarmed when he noticed that the driver kept closing his eyes, seemingly falling asleep behind the wheel, only to jerk awake after a few moments. My husband chose to become strategically chatty, and spent the rest if the 90-minute drive trying to keep the driver awake. 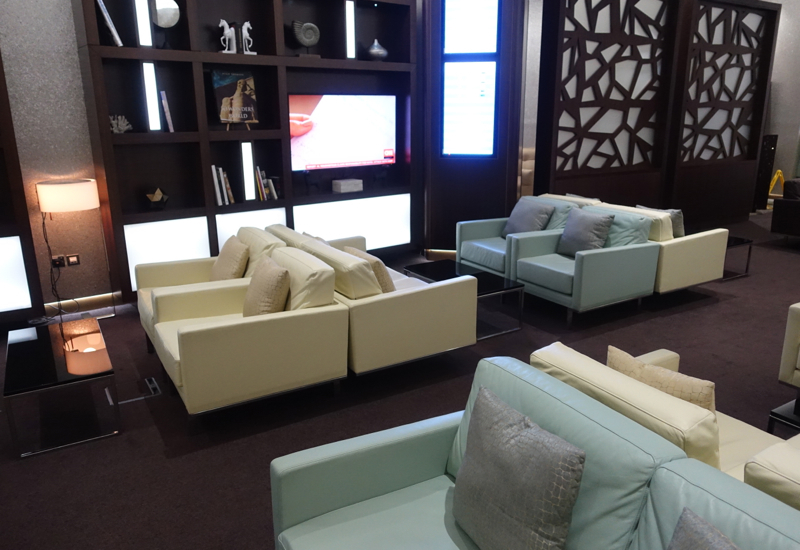 Upon arriving at the Abu Dhabi airport my husband headed for the Etihad First Class check-in area, a separate set of rooms that feature agents at desks and a chair for you to relax in during the check-in. From there he quickly breezed through priority security, and headed off for the lounge, which you reach by following the signs and taking a left near Gate 35. 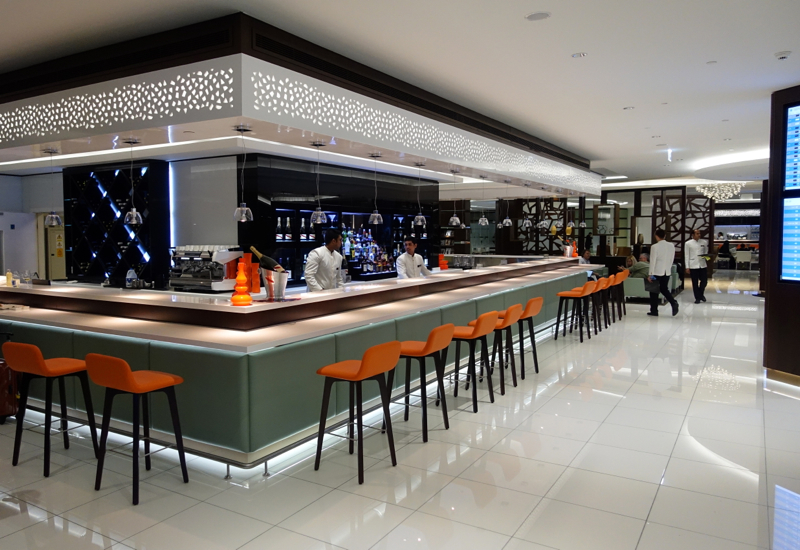 The Etihad First Class Lounge at Abu Dhabi is under renovation (latest word is that it will reopen mid to late 2016–which probably means 2017 if ever), so my husband was shown to the Etihad Premium Lounge, a Business Class Lounge, which currently hosts both First Class and Business Class passengers. 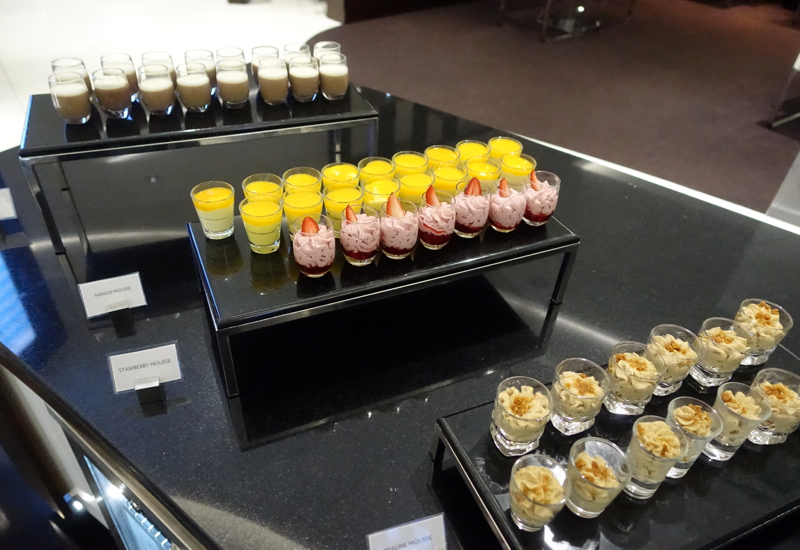 Any disappointment he felt was quickly dispelled by the opulence of the Business Class Lounge. The area was very spacious. He had arrived for an evening flight, and the lounge was completely deserted. 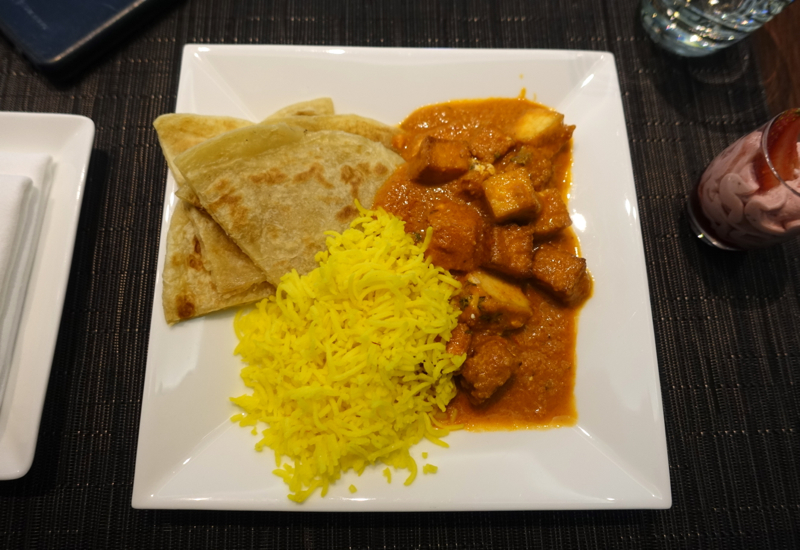 He decided to start with a quick dinner of tofu masala with rice and naan bread, and chose chose one of many empty tables. The course was good enough, but not anything special. 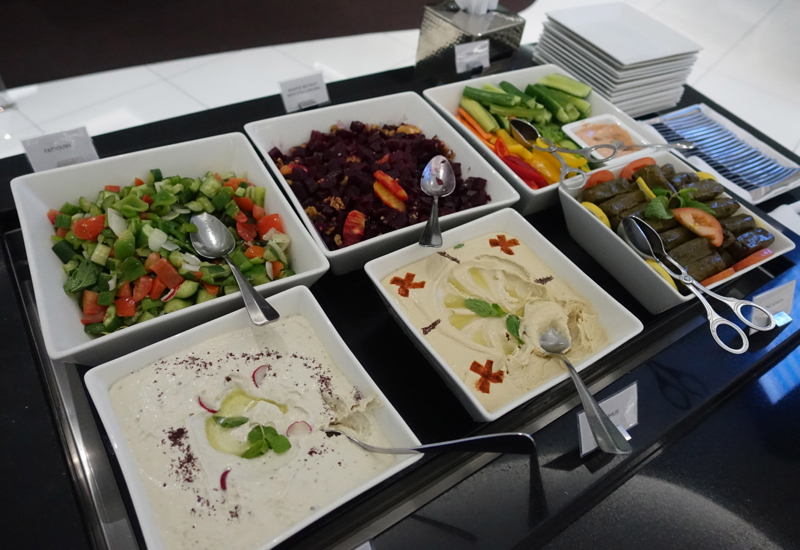 He also had some vegetables with hummus and baba ganoush, which was simpler and better. 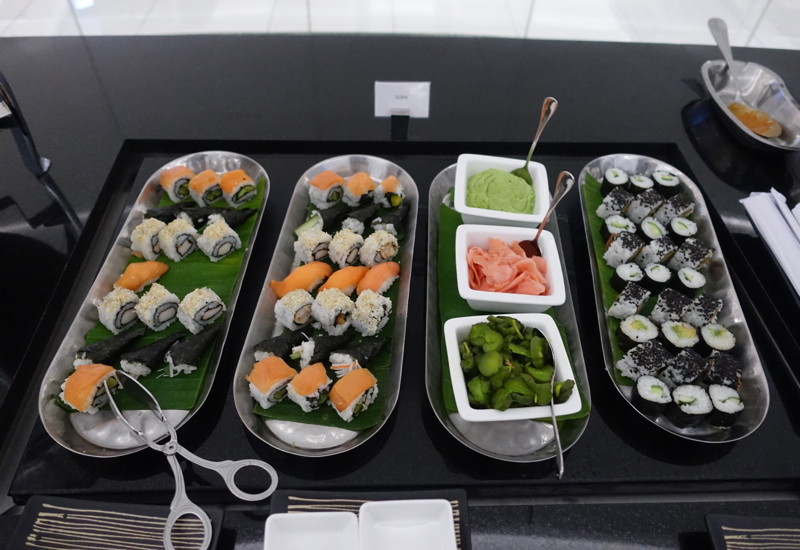 There was a wide array of food from which to choose, including other hot entrees, sandwiches, and sushi. 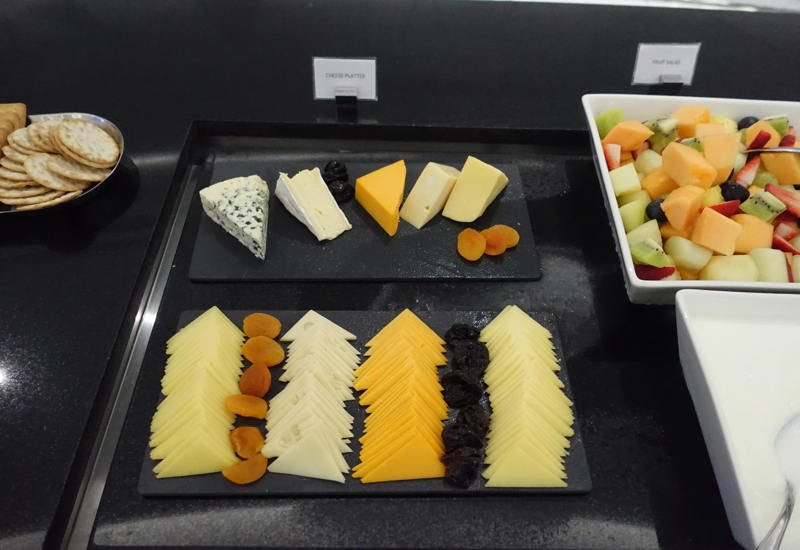 There were also various cheeses from which to choose and a decorative display of desserts. 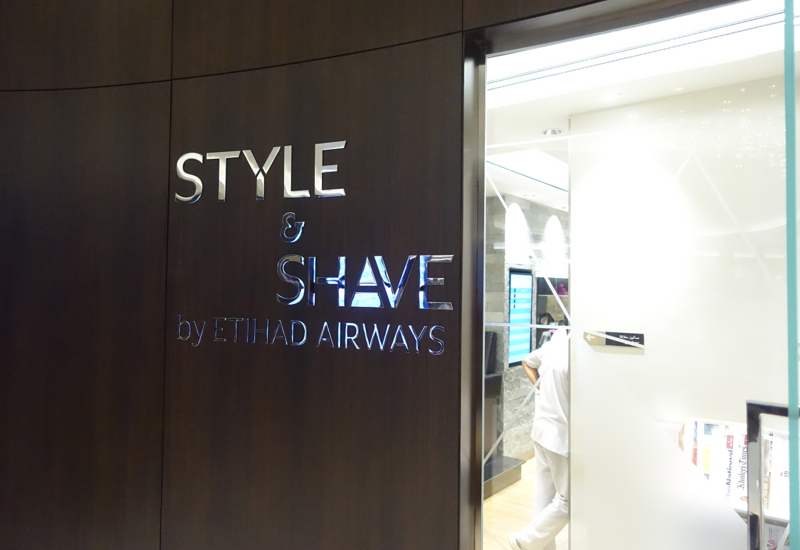 The highlight of his brief stay at the lounge was a visit to the “Style and Shave” section of the lounge. Upon arrival, the attendant at the greeting desk had run through a brief description of the lounge, and in his haste to get settled in he had only vaguely heard mention of something about free haircuts. So after dinner he returned to the attendant to ask about whether he had heard correctly. Yes, she said, and pointed him toward the right area. He then received one of the better-looking haircuts he has had in quite awhile, performed by a very gifted and pleasant barber. 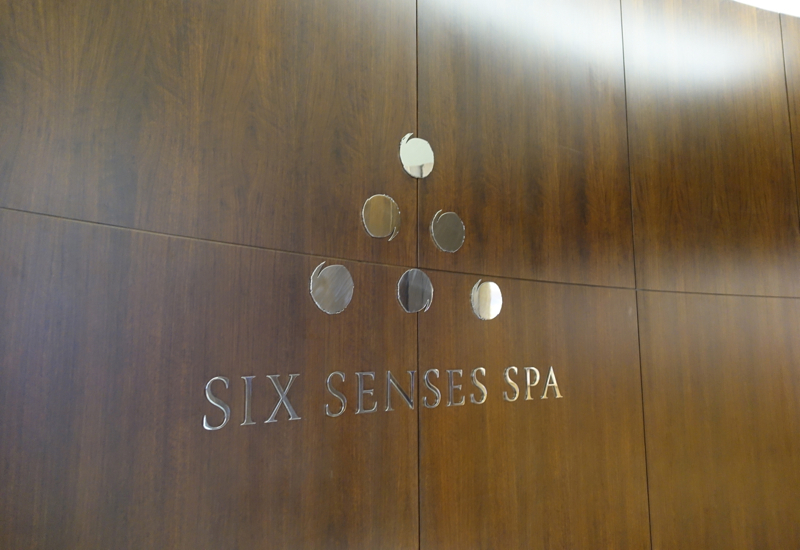 There is a Six Senses Spa, although my husband didn't take advantage of any of the complimentary massages (although I did on my own visit to the Etihad Premium Lounge on our return from Australia, which I'll post later as my own review). 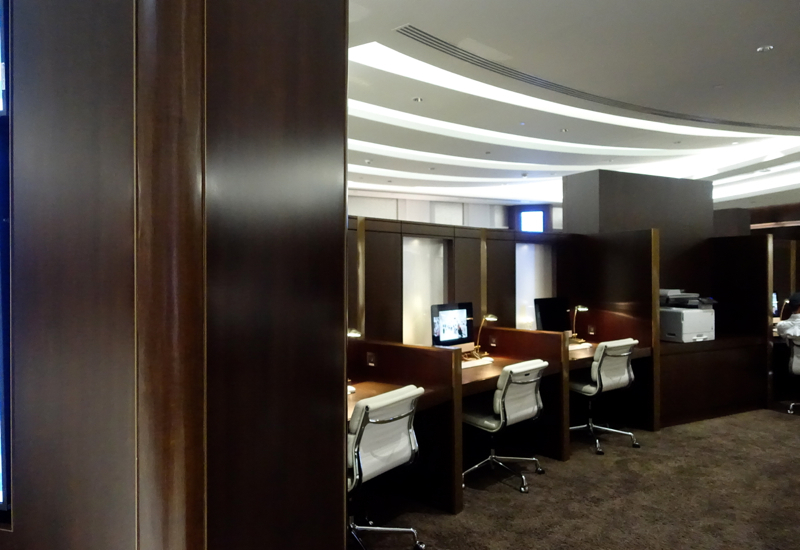 The lounge of course has a business center with computer work stations. 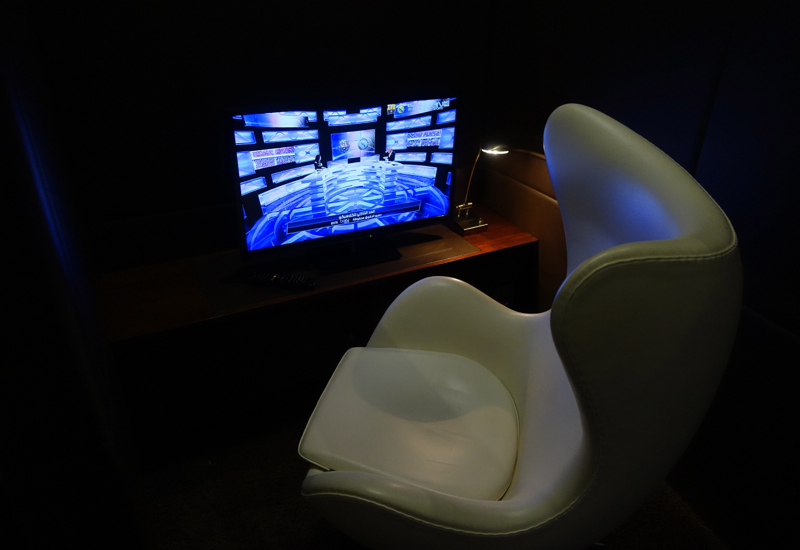 But it also has an entertainment area, for guests who like to play video games. 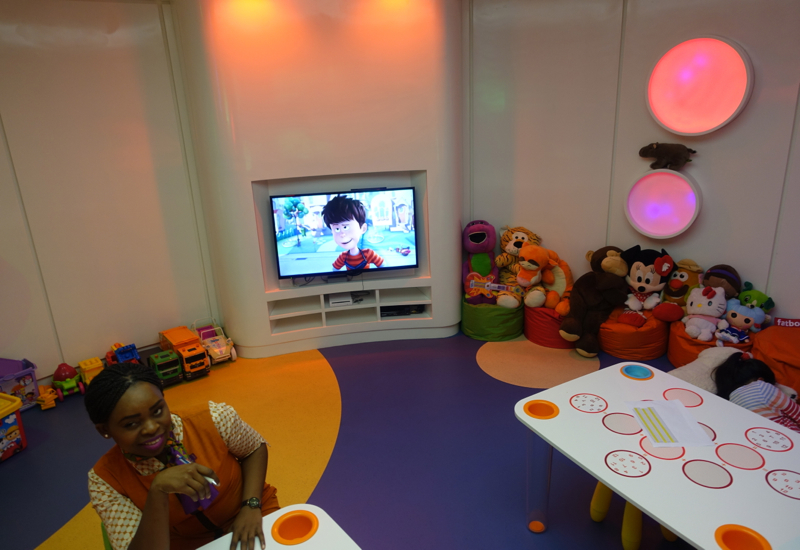 The lounge also features a children's play room, staffed with friendly helpers. 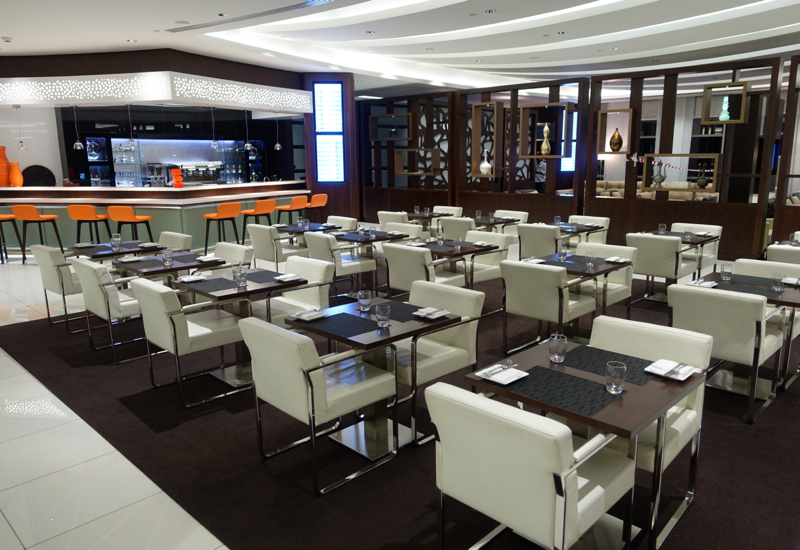 Throughout my husband's stay at the lounge he found the staff to be uniformly helpful and attentive. 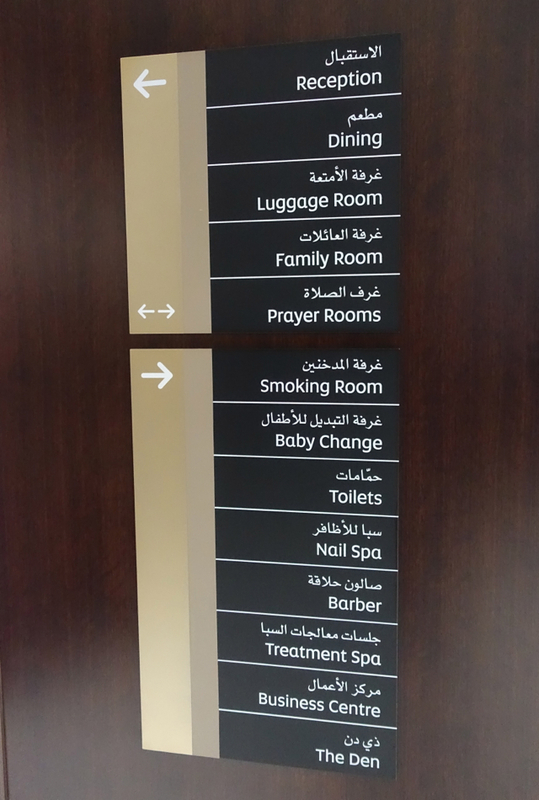 And if you are tired from traveling and find yourself lost in the immense empty space of an Abu Dhabi look lounge, the posted signs can be quite handy. 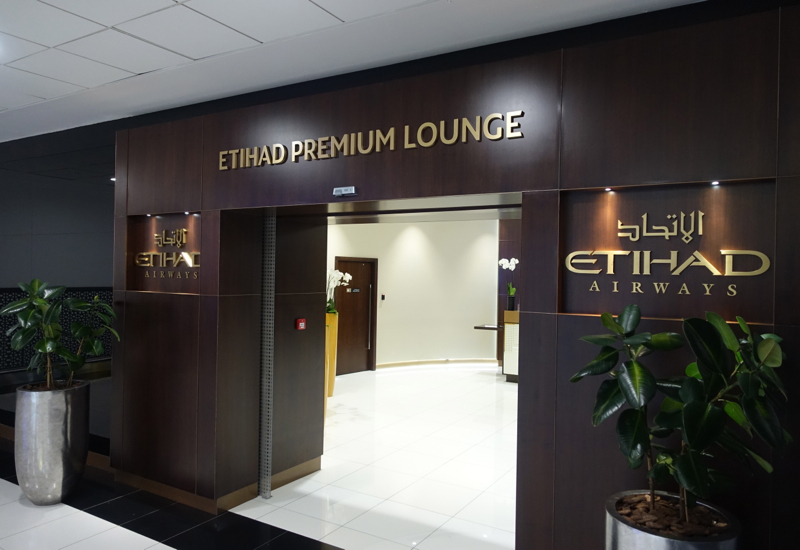 My husband summed up his Etihad Premium Lounge experience: “Middle eastern carriers certainly know how to do airport lounges. I loved my haircut, and although the food was not top-notch, I found the overall experience to be highly pleasurable.” He confessed that he found it all a bit surreal, especially after a long flight, to find himself surrounded by such brightly-lit but vacant trappings of luxury. This was also no doubt due to the time he was flying–my own experience was a bit different, but I'll save that for my review.